Dogs can be the joy of our lives, but there’s no doubt that they add a lot of work on the part of their owner as well. Aside from having to potty train your dog, one of the biggest cleaning chores they’ll add to your list is having to clean up dog hair. The good news is that not all dogs shed that much. Some will leave hair wherever they go whereas others won’t even leave a noticeable amount of hair in their trail. Read on to learn some helpful tips for dealing with the former. Just like with human’s if you don’t bathe your dog enough, they’re going to be more likely to leave hair everywhere they go. Some people only bathe their dog once every month or two or not at all for that matter. However, if you want to reduce the amount of hair in your home you should try to bathe them once a week. If it’s summer and the weather is nice, why not do it outside? You’ll get to enjoy the weather at the same time and there will be no mess to clean up. Another way to reduce hair around your home is to keep your dog groomed. 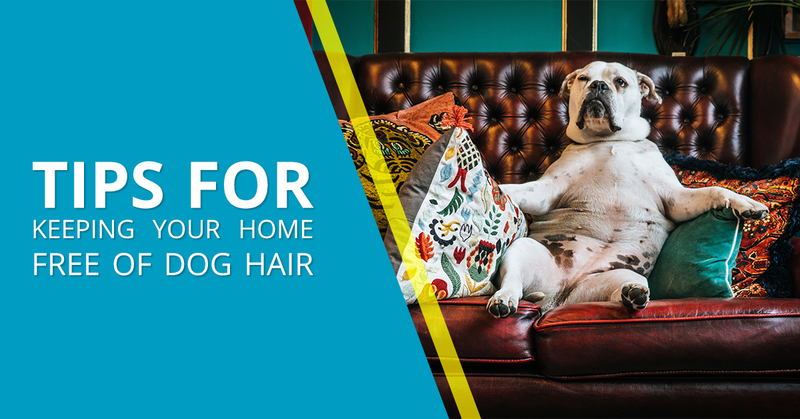 If your dog has long hair that looks like it hasn’t been cut in months or years, you can definitely expect to see more hair around the home. Not only that, but they’ll leave a lot more dandruff laying around which is just as bad or worse. Remember, dogs have a lot more hair than you do. If you think your head produces a lot of dandruff, just imagine how much a dog is leaving around the home. Also like humans, if your dog isn’t staying hydrated, they’re going to have dry skin. Dry skin leads to flaky skin and flaky skin is unhealthy. Unhealthy skin will eventually lead to more lost hair around the home. Ultimately, if your dog or other pet is losing so much hair and leaving it around the home that you don’t know what to do about it, you’re probably going to need to speak with a vet. They’ll be able to tell you why they’re shedding so much hair and what you can do about it. Crown Products has a variety of household cleaning supplies for sale. If you’re having problems with too much dog hair in your home, consider buying one of our adhesive lint roller cleaners. These aren’t just for dog hair though, just about anything you need done, you can do with these adhesive rollers. We also have indoor pet sanitation stations to help you clean with added convenience. If you have any questions or you’re ready to purchase our cleaning products, give us a call today. We’d be happy to speak with you.